An evening with MIT professor Jon Gruber, co-author of Jump-Starting America, which identifies Rochester as the #1 city with ingredients for economic growth. The evening's events include a panel discussion with Gruber, Robert Duffy, president of the Greater Rochester Chamber of Commerce; Staci Henning, vice president and chief marketing officer of the Greater Rochester Enterprise; and James Senall, president of Nextcorps. The American economy is growing slowly, and economic opportunities are concentrated in a few superstar cities on the coasts of the country. A return to broader prosperity should begin with a lesson from our own past. Over the two decades after World War II, the federal government invested massively in science and technology, resulting not only in the inventions that changed our lives, but a broad and highly paid middle class. Without this kind of significant public investment, private enterprise will not build the scientific foundation needed for the cutting edge industries - and good jobs - of tomorrow. We lay out a plan for developing the new American growth engine, identifying over a hundred communities - Rochester primary among them - that could build a more innovative and dynamic future. Introductions by Rob Clark. There will be a book signing following the panel discussion. On time, great presentation, good panel discussion ... but a lot of work to do on the part of GRE and GRCC to reconcile the difference and contrast of Rochester's #1 "Jump" rating with also being close to the top in concentrated and childhood poverty as well as one of the lowest performing/achieving school districts in the Country. Excellent event!! Thank you, UR for organizing! 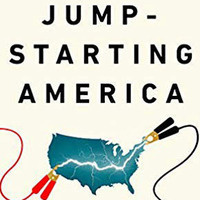 Jumpstarting America is an absolute must read for the citizens of Rochester, Buffalo, Syracuse and Binghamton-Ithaca. The underlying concept is that Rochester and Western NY, which I call STEM Valley is the core area to rebuild our struggling national and regional economies - both of which are sub-par despite the nonsensical PR that calls it great. Our firms ATVentureCenter www.atventurecenter.com has already launched a discussion and workshop on these concepts to Jumpstart our city and region and to build it into Mini-Silicon Valleys by creating an army of technology entrepreneurs in our existing manufacturing firms and startups. The workshop is April 26th at our training center in Legacy Tower (formerly Bausch & Lomb) downtown Rochester. Starts at 7:30 am ends at 9. Register on eventbrite.com. Seating is limited to 100 so reserve now. We anticipate a sell out.